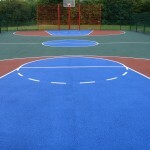 For schools and clubs who are looking to install a sports court facility, macadam surfacing is a popular choice as it requires little maintenance is provides great playing qualities for a number of sports such as netball, basketball, tennis and multi sports. It’s important for any organisation to choose macadam surface suppliers who will provide a great service and an excellent end product which performs well and is safe and suitable for use with a number of sports. Doing background checks on previous work and case study examples of the macadam surface suppliers you choose will help you make sure you have chosen a specialist sport surfacing company who will build a top quality sport court facility which meets your requirements. As experienced macadam surface suppliers and installers we can carry out the full construction of a macadam court or multi use games area with extra equipment and applications. 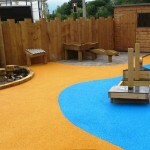 These extras can include anti slip paint coatings and line markings, maintenance equipment, fencing, and floodlighting in a range of specifications to suit different budgets and requirements for each project. 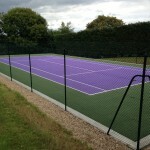 We aim to give you a fantastic end product which suits your sporting requirements and keeps costs down as much as possible to fit within your individual budget for the sports court installation project. You can find out more information about the different macadam surfacing specifications and services we provide by looking through the rest of our website where you can find details about construction and maintenance. If you’d like to send us an enquiry about macadam sport surfacing or any of our other products or services, please fill in the contact for with as much information as you can and we’ll get back to you with some friendly advice regarding costs and quotes.